INSECT DEFENSE IS NOT PERFECT! Warning colors (bright black and yellow, black and red banding, red coloration or markings), spiky, venom-filled hairs, camouflage, posture reversal, and hairs and bristles -- all these defense mechanisms are often effective in protecting insects from being eaten by predators. As you can see below, they do not always keep the insect hidden or warn predators to stay away. This is a good thing! Insects are the food source for all sorts of animals -- birds, reptiles, amphibians, other insects, mammals. And just think, if no insects died, the world would be overrun with millions and millions of insects. I apologize for so few examples, but most of the defense failures were meals and therefore not available for a photograph! ​​Click on a photo to make it larger. 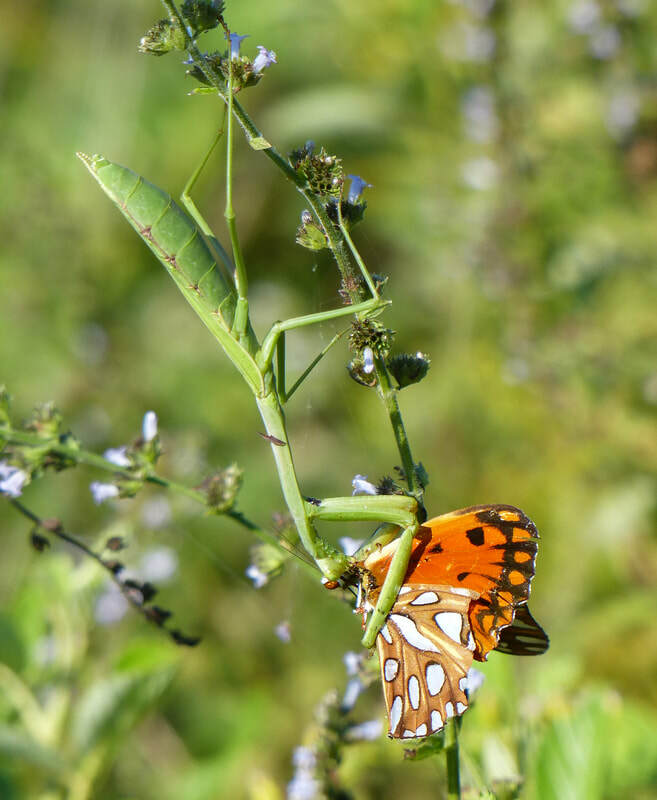 The bright orange, white, and black markings of the Gulf Fritillary Butterfly did not frighten this Larger Florida Mantis (Stagmomantis floridensis) away. 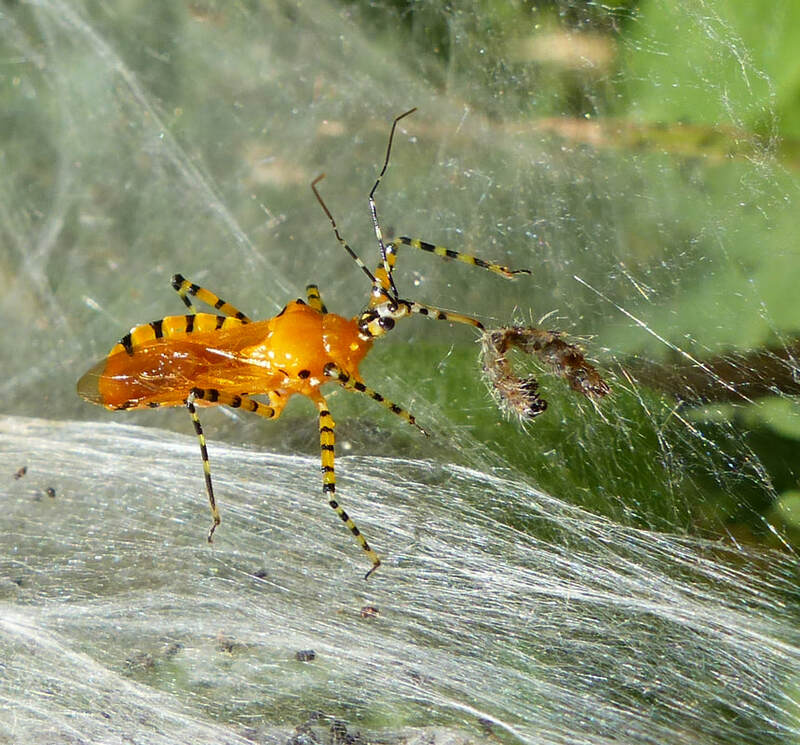 Nor did its coloration hide this caterpillar from this Assassin Bug (Pselliopus barberi). 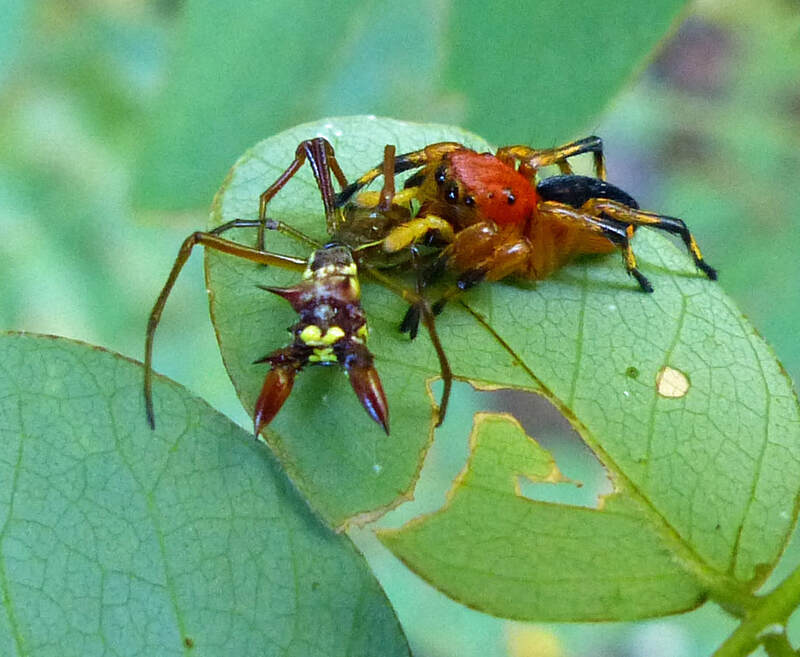 Nor did the thick spikes and protuberances on its posterior and bright yellow, red, and black coloration of the Micrathena Spider scare away the equally bright red-headed Jumping Spider (Phiale mimica). 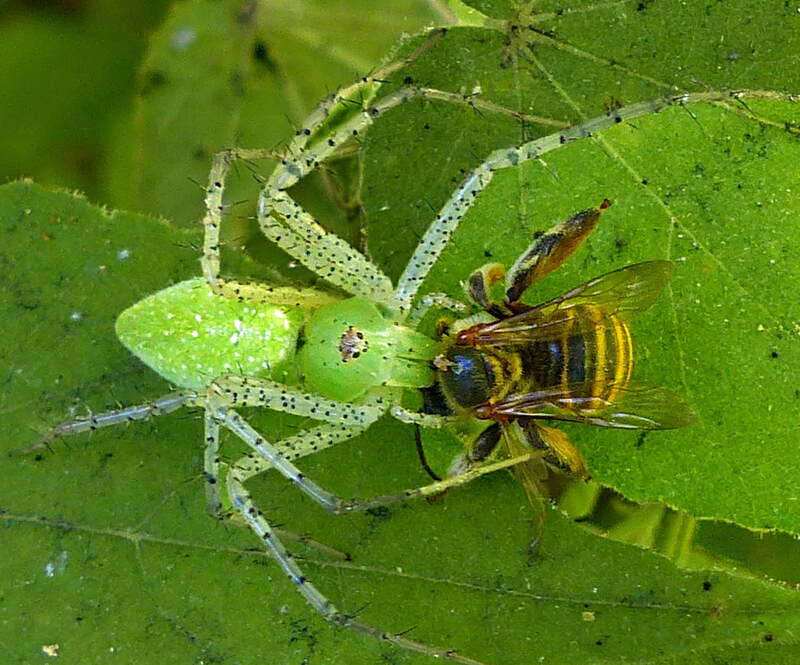 This Green lynx spider wasn't stopped by the black and yellow warning stripes of the bee. The Saddleback Caterpillar has many defense mechanisms -- sharp, spikey, venom-filled spines, camouflage, eyespots -- yet, a wasp, probably a Braconid Wasp, parasitized it. The Braconid Wasp lays her eggs into her victim with a long, sharp ovipositor. 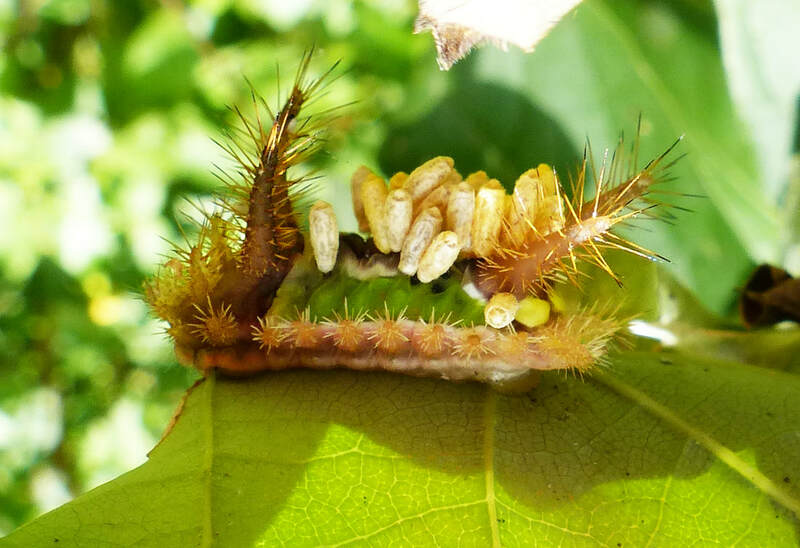 Inside the victim, the eggs hatch into larvae, which proceed to eat out the nonessential organs of the caterpillar. The cocoons on the Saddleback's back were filled with the wasp pupae. When they became adults, the cocoons popped open, and the wasps flew away. ​This fall, I took the photo above of a Bold Jumper eating a Gray Hairstreak. Apparently this should not have happened because hairstreaks have evolved specifically to escape from jumping spiders! “In the behavioral study published online March 8, 2013, in the Journal of Natural History, Andrei Sourakov collection manager at the McGuire Center for Lepidoptera and Biodiversity, conducted the first direct test of the defense mechanism of hairstreak butterflies. When the hairstreak butterfly faced the jumping spider in an enclosed space, the butterfly successfully escaped 100 percent of the time. The study shows jumping spiders may have influenced evolution of some butterfly patterns and behaviors. When 11 other butterfly and moth species from seven different families were exposed to the jumping spider, they were unable to escape attack in every case. Sourakov collected data by analyzing the videotaped results in slow motion. All photographs on amazingnature-nancygoor..com are copyrighted. ​If you wish to use or purchase any photographs, please contact Nancy or Ron Goor at ron.nancygoor@gmail.com.